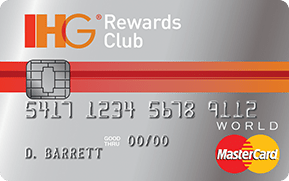 The IHG Rewards MasterCard is a rewards credit card aimed at people who travel often and prefer InterContinental Hotels Group (IHG) properties for their accommodations. There is currently a new member signup bonus offered to those who qualify plus the first year’s membership fee ($49) is waived. The IHG Rewards MasterCard is a World MasterCard issued by JPMorgan Chase. Once you qualify, it may take between 6-8 weeks for the bonus points to post to your account. Note: your account must be open and in good standing to receive the 60,000 bonus points. Additionally, this offer is not available to current cardholders or previous card members who received a new member bonus within the last 24 months. There is no limit on the number of points you can accumulate with the IHG Rewards Club program. Card members can redeem points for Reward Nights with as little as 10,000 points- up to 50,000. There are no blackout dates and cardholders can combine points with cash at any of the IHG hotels and resorts. Points can also be redeemed for flights, merchandise, and car rentals. Cardholders receive an additional 10% rebate on IHG Rewards Club point redemptions. For example, if you redeem 40,000 points, you will receive 4,000 points back. The maximum number of points rebated to your account cannot exceed 100,000 in a calendar year. Note: You should allow 4-6 weeks for the rebated points to be deposited in your account after the date of redemption. That is a grand total of 4,000 points earned which is a great rate of return for one night’s stay- especially since you can start redeeming with as little as 10,000 points. The 50% bonus on base points is one of the features of the IHG Rewards MasterCard that sets it apart from much of the competition. Card members receive an annual free night beginning with the first anniversary date of when your account was opened. The Annual Free Night can be used at any hotel in the IHG portfolio. Important: Rooms are limited and subject to availability. The Free Night must be redeemed and the stay completed within 12 months from the date of issue. It is valid for one standard room night rate and applicable taxes only. The annual percentage rate on purchases is 15.99% (variable and based on the Prime Rate). The APR for balance transfers is also 15.99%. Additionally, a balance transfer fee of either $5 or 3% of the total amount of the transfer (whichever is greater) is applied to each completed balance transfer. At this time, there are no introductory APRs offered with this card on either purchases or balance transfers. Members are not charged foreign transaction fees when using the card for purchases outside of the U.S. Currently this card does not come with chip-enabled technology. The annual fee for this card is $49 which is waived for the first year of membership. Below we have broken down the specific details of the IHG Rewards MasterCard to help you determine if it’s the right card for you. New card members have the opportunity to earn 60,000 bonus points upon approval. To receive this bonus you must make at least $1,000 in eligible net purchases on the card within the first three months that your account is open. Note: this offer is not available to current cardholders or previous card members who received a card member bonus within the last 24 months. This is a generous amount of points considering that Reward Nights redemptions start at as little as 10,000 points. Plus, the $1,000 spending threshold spread over three months is very reasonable compared to many other rewards cards. Points are earned on net purchases. Excluded are credits, returns, balance transfers, cash advances, and any cash-like transactions (charges for traveler’s checks, money orders, or foreign currency). There is no cap on the amount of reward points you can accumulate. Members receive an Annual Free Night award on each anniversary date from when your account was originally opened. This award is good for any hotel in the IHG family of brands world-wide. Rooms are limited and subject to availability. The award is valid for one standard room night rate and applicable taxes. Your account must be active and in good standing to qualify for the Annual Free Night. With Reward Nights redemptions starting with as little as 10,000 points, this feature delivers solid value. Members receive an additional 10% rebate on IHG Rewards Club point redemptions. For example, if you redeem 40,000 points, you will receive 4,000 points back. Note: The maximum number of points rebated to your account cannot exceed 100,000 in a calendar year. You should allow 4-6 weeks for the rebated points to be deposited in your account after the date of redemption. Reward points can be redeemed for hotel stays, flights, car rentals, and merchandise. IHG has a large portfolio of properties (over 4,700 worldwide) so no matter where you travel, you will probably be able to find a hotel where you can use your points. Card members are not charged foreign transaction fees when using the card for purchases outside of the U.S. The annual membership fee for the card is $49 which is currently waived for the first year. Generally, a very good credit score (720+FICO) is needed to be approved for this card. The card not having chip technology can be a hassle for someone who travels a lot internationally. This card delivers the greatest benefits to people who often stay at hotels in the IHG portfolio. The 5X points are very generous but if you almost never choose a hotel in the IHG family, there is little chance of earning significant rewards points. The 2X points rate offered on gas, groceries, and restaurants is fairly standard. However as is often the case, this double rewards rate comes with a disclaimer about Merchant Codes. This basically means if your gas, grocery, or restaurant transaction is not submitted with the correct Merchant Code it will not be eligible for the 2X rewards points. Purchases made at big-box retailers (WalMart, Target) and retail clubs such as Costco and Sam’s generally do not qualify for the 2X rewards. Lastly, 1X points on all other purchases is not a great rewards rate. Unless you are an IHG loyalist and can take full advantage of the 5X points rate, you might want to consider another card that delivers better rewards on everyday purchases.